LoveToKnow interviewed Brit Hyde, Brand Manager/Marketing Services of Bil-Jac dog food. Learn more about Bil-Jac's dry kibble formulas as well as their frozen dog food and decide whether it's best for your dog. LTK: Brit, please give our readers a little of the history behind Bil-Jac dog food. BH: In the early 1940s, two brothers, Jack and Bill Kelly returned from fighting in World War II and noticed a gap in the pet food market. They realized that there was a lot that could be done with regard to pet nutrition, especially for cats and dogs, and the brothers made great improvements in what was being offered. With the launch of Bil-Jac Frozen Dog Food, the brothers founded Bil-Jac Foods, Inc., headquartered in Medina, Oh. Today, Bil-Jac is growing at a rate of nearly 20 percent, and over the last several years, Bil-Jac Foods has hit the global markets of Japan, Canada, Chile and Korea. LTK: Dogs have slightly different nutritional needs throughout the various stages of their lives. What formulas does the company offer? BH: Bil-Jac offers Select, Reduced Fat, Puppy, Senior, Large Breed Select and Large Breed Puppy. LTK: What are the first five ingredients listed on the Select label, and can you tell us how each one benefits our dogs? BH: The first five ingredients are: Chicken By-Products (Organs Only, Including Chicken Liver), Chicken, Corn, Dried Beet Pulp and Brewers Dried Yeast. The first two Chicken ingredients are fresh chicken, and they are the predominant ingredients in the food. Most dry dog foods don't have any fresh ingredients. Those that do list Chicken as an ingredient have less than a ¼ of their formula using fresh meat ingredients. With Bil-Jac, over half of the formula is real fresh chicken ingredients that provide protein and energy for a dog. The whole grain carbohydrate source in Bil-Jac dry foods is corn (in our Senior Formula we also use Oatmeal) that is processed in such a way that the carbohydrates are completely available to your pet for thorough digestion. Corn is an excellent carbohydrate - an essential element of a dog's diet for energy. Careful processing of any carbohydrate is essential for energy and digestibility. Two factors should be considered with respect to carbohydrates in animal diets. First, the quality of the grain should be the finest. At Bil-Jac we take special care in sourcing only the finest grain. The second concern relates to the conversion of the complex carbohydrates in the grain to simpler carbohydrates, which are then available to the animal. Bil-Jac is able to convert 98% to 99% of the complex carbohydrates we use to simpler carbohydrates with our unique processing procedures. Dogs simply can't digest complex carbohydrates, so it's essential to break them down for digestibility. Dried Beet Pulp is a highly digestible energy source for dogs, Brewer's Yeast is rich in protein and Vitamin B.
LTK: Bil-Jac also makes a frozen dog food. What can you tell us about that, and are there any special benefits to feeding this style of food? Bil-Jac Frozen is not widely distributed as the distribution and retail infrastructure for frozen pet food is not well developed. Our frozen food is distributed off our own trucks whereas most other pet foods comes to store via their internal distribution system or via pet food distributors who lack the capability to deliver significant quantities of frozen products. LTK: Many dog food manufacturers use high heat processing to make their products. Why does Bil-Jac use low heat processing? BH: In order to protect the meat's nutrients, we use the industry's only low temperature vacuum process. This means the heat sensitive amino acids are protected from heat damage that occurs in most "expanded" dog foods. Additionally, we add just the right amount of vitamins and minerals to make a complete and balanced diet for dogs at every stage during their lives. LTK: Bil-Jac was not part of the massive dog food recall of 2007 that involved contaminated gluten. Would you tell us why gluten is included in some dog foods and why Bil-Jac doesn't use it in their formula? BH: Bil-Jac only uses grains and meats that have domestic origins. To that end, Bil-Jac does not use any gluten meals, including wheat gluten meal, in any of our products. Bil-Jac is gluten meal-free, simply for the reason that it is not an ideal source of protein for dogs. And our primary focus has always been on providing the optimal nutritional formula so that dogs can reach their full healthy potential. To make a healthy dog food, the best protein ingredients are animal proteins. These are the proteins that dogs, by nature, can easily digest and absorb as nutritional sources. LTK: Where does the company acquire their ingredients from and is the food manufactured in the USA or abroad? BH: Bil-Jac only uses meats from the USA and all of our products are manufactured in Berlin, MD or Medina, OH. We manufacture our own food and soft moist treats in our own facilities, under our own stringent quality guidelines. We've been making our own food since 1947, and pet food is our only business. We are family owned and operated. LTK: What is the average turn around time from manufacturing the food until it hits store shelves? BH: Generally we make food no more than a couple of weeks before we ship it. It is distributed to retail chains fairly promptly. We need some inventory to address surges in orders, but we try to maintain as short a lead-time as possible from the time we manufacture our food until it ships from our plant. Our company philosophy is all about freshness. LTK: What does the company use to preserve the freshness of the food? BH: In the case of frozen food, the only preservative is freezing. In our dry food, because we start with so much more real fresh chicken ingredients (over half the recipe), we use BHA as an antioxidant. To provide a product that is nutritious and safe for your pet's consumption, certain components in the diet must be protected from breakdown or oxidation. The primary component that must be stabilized in the diet is fat. Antioxidants must be included in the diet to prevent this oxidation of fats. Without the inclusion of antioxidants in the food, fats will oxidize with storage over time. The oxidation process, or lipid peroxidation, involves an attack on the fat by an oxygen free radical. A fatty acid radical is produced that can react further with oxygen to produce peroxides. Lipid peroxidation produces a rancid smell and flavor. The formation of harmful peroxides makes the food unsafe for consumption. Antioxidants function by interrupting this chain of reactions, terminating the free radical chain in lipid oxidation. Antioxidants have been approved for use in human and pet foods since 1947. BHA is a synthetic antioxidant that is used commonly in both human and pet foods. It is very stable and not easily destroyed by food processing. Thus, it can be added at very low levels to dietary fat, and still be highly effective in preventing oxidation. Examples of foods for human consumption that contain BHA are lard, shortenings, vegetable oils, crackers, potato chips and other snack foods. BHA may also be found as an antioxidant in cosmetics, prescription drugs, and in some vitamin A preparations. LTK: What is the Bil-Jac challenge? BH: We say that our dog food is what your dog would choose if given a choice. 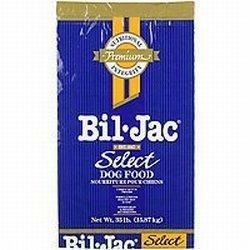 Simply place a bowl of Bil-Jac next to your current dry dog food at regular feeding time. You'll see that freshness does make a difference and that your best friend is our best sales dog. As in your diet at home, freshness of ingredients and careful preparation lead to a diet that is both superior in nutrition and delicious to eat. A dog has a keen sense of what will taste good. and our careful processing of fresh meat ingredients addresses your dog's instinctual desire for wholesome nutrition. LTK: Where can consumers find Bil-Jac products? BH: Simply visit our website, and type in your zip code in our Dealer Search function to find a retailer near you. Bil-Jac dry dog food products can only be purchased at a local pet store or through your pet's veterinarian; they are not available at Grocery, Mass Merchandisers or Drug Stores.